For those of you who are veteran travelers, you know the perils of finding a decent place to lodge. There are the plastic hotels, the nightmare B&Bs, the $25 Internet surcharges, even bedbugs! So, when I travel and find a clean, quiet, fair-priced place to lodge, I consider it a gift. The Borgarnes Bed and Breakfast in Borgarnes, Iceland is one such gift. It is nothing short of a jewel in a treasure chest of eye candy that is Iceland (at least for us photography types). Arriving exhausted after a full day’s shooting, my colleague Richard and I were more than pleasantly surprised to check in with the owner, Inger Helkadottir, a retired sheep farmer. Inger runs an immaculately clean house, that manages to radiate warmth. Outwardly unassuming, the B&B sits on a ledge overlooking the harbor and the Northern Atlantic beyond. The rooms are spacious by European standards. The shared bathroom is kept spotless. Fresh towels and washcloths, as well as comfortable bathrobes are provided. 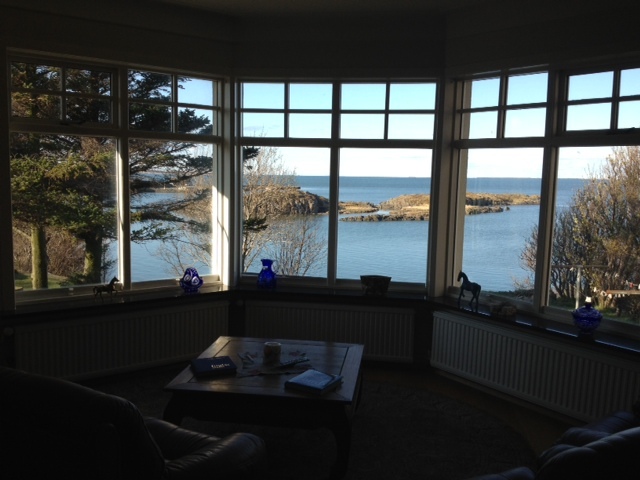 There is a comfortable sitting room with to-die-for views of the harbor and rocky, bird-filled islets. The house sits at the end of a quiet street, so we each had a blissfully restful sleep. Breakfast included pancakes, cereals, cheese, freshly baked whole grain bread (baked by Inger), vegetables, juice, sliced eggs, and fresh jams. In fact, despite our rigorous shooting schedule, Richard and I decided to linger to enjoy the solitude and the views.